Members of the Harry Ransom Center enjoy insider access and behind-the-scenes glimpses of the cultural wonders we keep secure for the future. We offer members invitations to exhibition openings and exclusive events; private exhibition and collection tours; and the latest news of acquisitions, programs, and more. 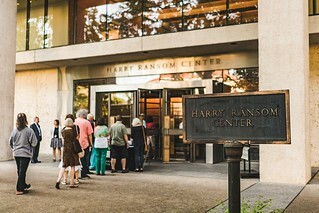 We invite you to join today to experience all that the Ransom Center has to offer. All members receive a 15% discount in the Museum Store with their membership card. * Individual memberships for students, faculty, and staff of The University of Texas at Austin, educators, and staff of nonprofit organizations are available at a discounted rate. Contact 512-232-3669 or membership@hrc.utexas.edu for more information.